Nashville is best known as the capital of country music, but located in the Cumberland River Valley surrounded by hills of the Highland Rim, the middle Tennessee city is also home to a great variety of hiking trails. 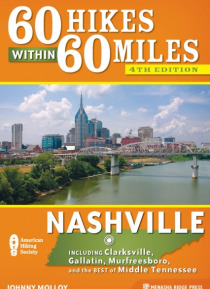 With new hikes and updated maps, trailhead directions, and photos, the new edition of 60 Hikes Within 60 Miles: Nashville by veteran Tennessee outdoorsman Johnny Molloy gives outdoor … enthusiasts plenty of hikes to choose from. From historical hikes such as the Gordon House and Ferry Site Walk and the Confederate Earthworks Walk to great recreational trails like the Anderson Fitness Trail and the Couchville Lake Loop, hikers of all ages and fitness levels will find a trail to their liking within a short drive from home.